Miami  Hector, the cabdriver who picked me up at the Miami International Airport and drove me to my hotel, the President at 14th and Collins in South Beach, knew his stuff. Not only did he outwit the traffic streaming away from downtown on night one of the Ultra Music Festial, he had the AC cranked and the RADIO OFF! I don’t know if he knew that these would be the last moments of quiet I would experience for days, but I certainly knew it, and I savored every metered minute of my ride in Hector’s mobile oasis of nocturnal silence. Miami is a loud town, and at the annual Winter Music Conference , every imaginable kind of world dance music fills the days and overflows the nights until the last DJ stows his decks. Even this most spring break-influenced of major American cities makes some effort to keep civil order, but it is done Miami style. At a quarter to midnight on Friday (way early by Miami standards) I witnessed a policeman policeman in shorts go to work on a man with a cocktail who stumbled off the curb just steps in front of him, utterly oblivious to the presence of the officer. The cop took a couple of athletic steps towards the probable DIP, who had by now aroused the concern of his entourage. Crouching alongside the reveler, the policeman executed an extremely effective, clearly practiced maneuver. Coming from below, he snatched the cocktail glass by its base and lifted it out of the guy’s hand without spilling a drop. No ticket was issued, and no warning was even voiced. I suspect that Mr. Open Container still does not know for sure what happened to that mojito. Supercop merely deposited said container in the nearest receptacle, and continued on his way-all in a night’s work for Officer South Beach, spring break unit. Once inside the hotel, I was delighted to find that our room was convenient, serviceable, and filled with some of my favorite New Yorkers, for whom the Winter Music Conference, held every year at the end of March, has become a rite of spring. Santa Barbara was a solid 75 degrees and sunny on the afternoon I left, depriving me of their “I’ve got to get warm” excuse, but does that mean I should forego Miami and the music industry’s most frenetic meet and greet? How about “no”? When I arrived, the conference had been going on for most of the week, and people were full of stories about the day and night before. The Bassnectar performance and the new Bassnectar CD, Underground Communication, were both declared genius. Santa Barbara will get a chance to decide for itself when Bassnectar appears at Lightning in a Bottle on May 12 at Live Oak. For those of you without that kind of patience, go to iTunes now and download OM Miami 2007, which is the compilation that was given away by Bassnectar’s label at the show. Our first and only stop Friday evening was Suite, where our closest friend in the DJ world, Adrian Bartos, aka Stretch Armstrong , would be spinning at 1a.m. What happened next? That’s right-a big, freaky South Beach door scene, complete with absurdly imperious French (!) doormen in Hugo Boss and Bluetooth, hundreds of overdressed club goers straining at the ropes, and more six-inch stilettos than in all the storefront knife displays in all the seedy blocks in all of downtown Miami. We were on the list, of course, but Nico, the most intensely French of all the many door people, found fault with our photographer’s footwear. “No sandals,” he told him, “not tonight-you are too casual!” Ever resourceful, our cameraman went off on his own to find an open shoe store (which he did, at one in the morning). We made our way into Suite, leaving the punters out front to lay down credit cards for $600 at the door (“It is bottle service only tonight, gentleman.”) just to be let in. Stretch was indeed on the decks, and our entrance was timed perfectly for five minutes before he began a fabulous set. Stretch Armstrong has a new mix CD) (that’s a free full-length download, by the way), his first in more than 5 years, courtesy of hip New York clothing label Triple 5 Soul. The total street cred Bartos gained with his famous radio shows on WKCR in New York put him in a perfect position to do pretty much whatever he wants. Anyone who would like to experience the true golden age of hip-hop should surf his old skool blog, and check out some of the amazing tracks and old radio shows he posted there. In the meantime, Stretch has devoted himself to pursuing the new and danceable across many genres and types of music-house, baile funk, rock, disco, and even electro and trance. He is one of the most sought-after party DJs in the world, and has held down steady gigs at the most exclusive clubs in Manhattan and toured all over the world. 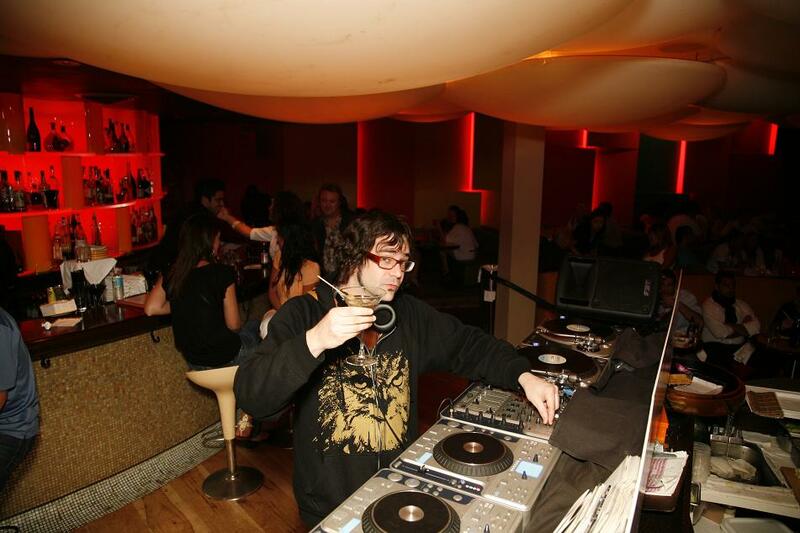 As for the company he keeps, on this night, it was the crew from X-MIX sponsoring the party at Suite, so he was appearing with Armand Van Helden , DJ Sneak, Junior Sanchez , Todd Terry, Bad Boy Bill, and Mark Farina. They are all managed by X-MIX, which is the number one supplier worldwide of major label remix collections to professional DJs. Drinks in Miami are shockingly expensive. $16 for a standard mixed drink isn’t at all unusual, and something with “call” liquor in it is going to be $18.50. And don’t forget to tip! There are no rules about smoking indoors, so people do so pretty much everywhere. Both of those are definite downsides for me. But the dancefloors are generally big, and you have to give Miami this-everybody dances there. 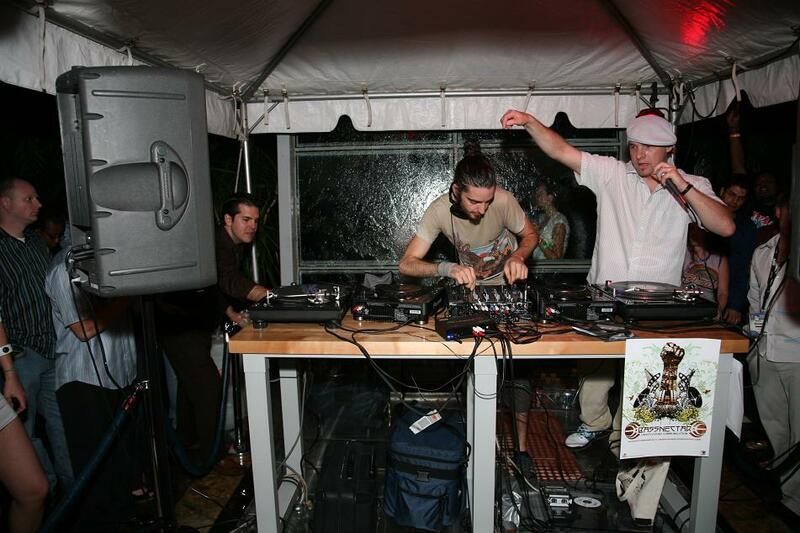 In fact, people in Miami for WMC dance even more than they smoke or drink, and that takes a lot of dancing. I saw people dancing in heels and in boots, barefoot and on tables, on sofas, on chairs, and on banquettes. I saw people dancing in the mud, in the rain, and in the Starbucks. The best dancer I saw was dancing in and out of the rain when no one else was dancing and no music was playing. Most nights it feels as though there’s just no end to it. On Saturday, our grand day out began at 6 p.m, when we made our way to Bicentennial Park in downtown Miami for day two of the Ultra Music Festival. The park hunkers among a cluster of half-finished skyscrapers in an area known as Bayport, and less than 15 minutes after we got out of our cab, the skies opened and soaked the acres of brown construction dirt surrounding the park with rain. The large crowd outside the venue became an impromptu wet t-shirt party, but we got lucky and found raingear for sale before we got really wet. 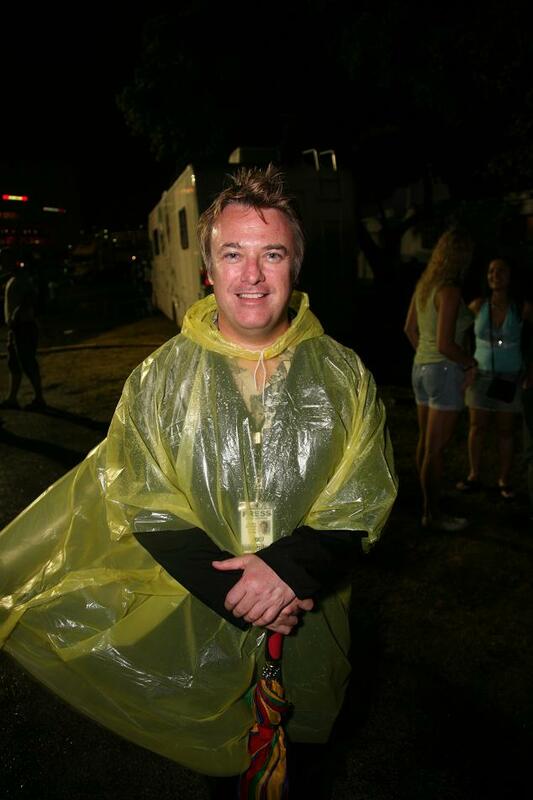 When it rains, it ponchos. Inside the park, the turf was strong and soggy, the music wild and loud. Over the next two hours the rain would come again 8 or 10 more times, often torrential, but always accompanied by powerful doses of Miami sunshine. The combination was disconcerting at first, then beautiful-a lot like the music playing in the Festival’s giant Techno tent. When we hit it, Richie Hawtin was doing a pretty good job of simulating heavy weather with the tent’s big sound system. At times the fog was so thick that you couldn’t see 5 feet, and then it would lift and there would be a couple of Miami fashionistas staring back at you. Sunday took us out to the new Standard hotel on the causeway for a party called “Miambient.” DJ Rara Avis, who will also be at Lightning in a Bottle, was spinning, and the venue was our favorite of the Conference. Andre Balazs, I want your life, even if you have apparently split with Uma. The Miami Standard is organized around a spa complex that resembles a Standard-ized version of the Delano’s pool area, and it is magnificent. I can imagine few things more appealing than a long weekend in one of these cabanas with the right companion. Book now while it remains so affordable-word is sure to get out about this sensual new retreat. 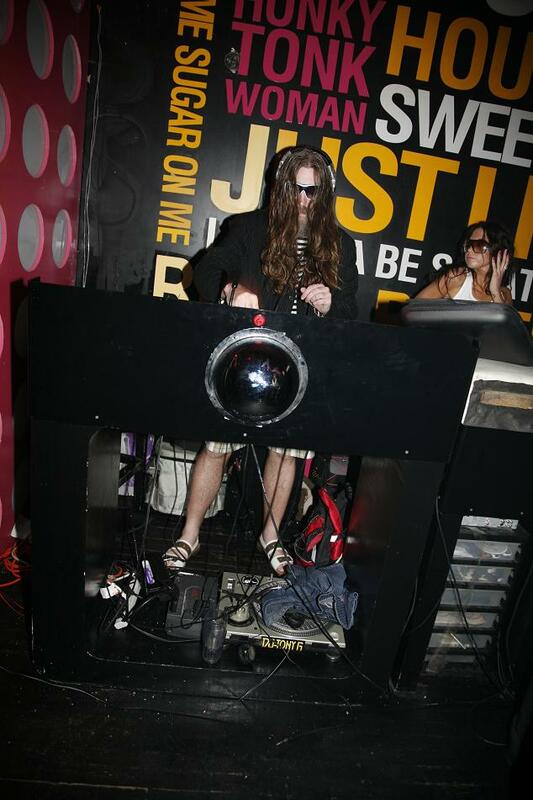 The DJ with No Socks. Sunday night’s party at Rokbar was thrown by New Yorkers DJs Are Not Rockstars and it was predictably messy and fun. This place goes hard every night, and often involves a heavy door scene, but you are guaranteed a memorable (or should that be “hard to remember”?) night. Ursula, the DJ who doesn't like photos. Elsewhere the fabulous Ursula was spinning at Sushisamba, where we ran into Richard Harris, a recent graduate of our own Music Academy of the West and a terrific trombonist. 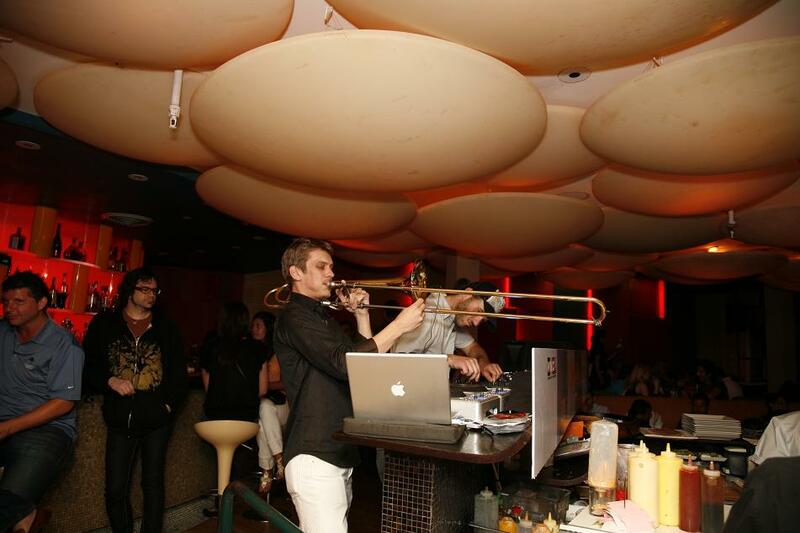 He put down a live set at Sushisamba that had him playing along to a DJ with an effects pedal attached to this horn. It was one of the golden moments of this trip-totally unexpected and completely right. Next door at Cafeteria they have a back room disco that does an amazing job of conjuring the vibe of an underground afterhours club. This was my favorite secret spot on this trip. If you can’t get your dance on in here you’re dead. Girls on scooters are cool. Are you exhausted yet? Me too-but not too tired to sleep on the amazing daytime sights of beautiful South Beach. These scooter girls were staying at our hotel. So get on the Vespa, and we will see you next year.